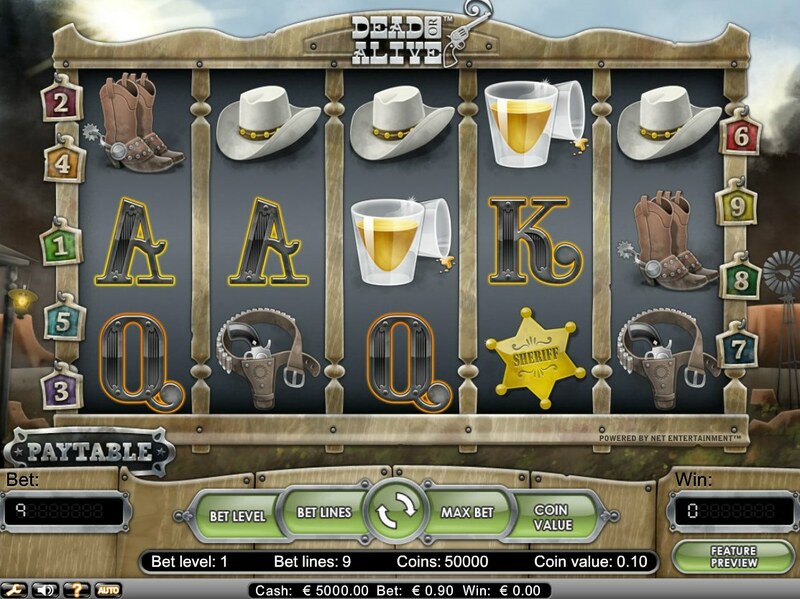 Slot developer NetEnt's Dead or Alive is a refreshing change from their normal slot game output. The Western theme for example is very unlike the Scandinavian company, who generally go for more modern themes with lights, bangs and wallops. There is also the volatility of this slot, which is off the charts high and is more reminiscent of a Aristocrat slot then a NetEnt one. The reels are typically filled with lots of Western-themed images, and the borders set the mood with thunderstorms and old-style lamps. 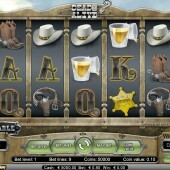 As for the icons we get the sheriff's badge, spurs, a cowboy hat, a whisky glass, a gun, and the usual poker symbols. The FX match the icons, and it's filled with a tonne of sound effects stolen from Leone's sound department. The Wild is represented by the Wanted poster, and substitutes for all symbols other than the Scatter, in this case the Revolver. Three or more triggers a free spins round, and this is where the Wanted poster comes into play, acting as a Sticky Wild during the freebies. Bonus spins also can be awarded if you bag extra Wilds on the reels during the free spins round. With 12 free spins, it can be a lucrative bonus round to trigger. As I mentioned at the top of the review, there's no shortage of good-quality Wild West-themed games out there in Slotsland such as Microgaming's treat of a slot Gold Factory, and this one sadly falls short. A lot of work has gone into the atmosphere of the game, but this is a NetEnt game - it's kind of what you expect. The Sticky Wilds make the free spins very interesting and there are tails on forums of some enormous wins coming from the bonus round. That being said, you also need to keep your bank roll in check with this slot as it is very addictive - be careful not to be lured into its trap!